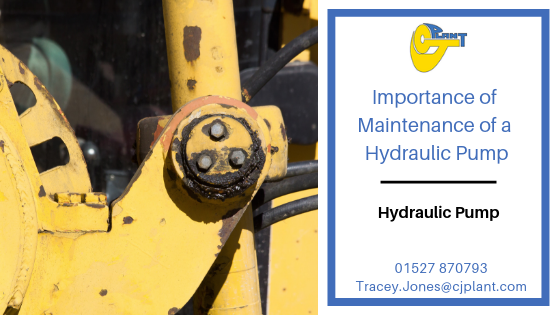 The importance of maintenance of a hydraulic pump cannot be underestimated. Failure to keep up with general maintenance is the main reason for hydraulic system breakdown. There are two main areas to look at when discussing the importance of hydraulic pump maintenance. The first is preventive maintenance. This is key to any programme of repair, regardless of the type of equipment. The second is corrective maintenance. If this is not performed to industry standard, it can result in component or total equipment failure. A trusted industry professional such as CJ Plant can help with hydraulic repairs and maintenance. Why choose Preventive Maintenance for a Hydraulic Pump? Preventive Maintenance of a hydraulic system need not be a complicated affair. If it is followed properly and done regularly, it can help to eradicate most hydraulic component failure. Does it work twenty four hours a day, seven days a week? Does the system operate at maximum flow and pressure up to seventy percent or better whilst in use? What environment is the system in? What are the stated preventative maintenance requirements for the Equipment Manufacturer on the hydraulic system? What are the specific requirements and operating parameters concerning the hydraulic fluid ISO particulate? What specific requirements and operating parameters are there in relation to the filters’ ability to meet this requirement? Is equipment history available to verify all the procedures for the hydraulic system? Each maintenance task must have written procedures in place, and they must be accessible, accurate and understandable by all maintenance personnel. What tools or equipment are required to perform the task? What are the safety precautions for this procedure? What are the environmental concerns or potential hazards? Preventive Maintenance techniques, implemented properly allow a maintenance department to control a hydraulic system, rather than it being the other way around! Hiring professionals to undertake hydraulic system maintenance is essential. Not only does it take simply and effectively remove stress from a working situation, but it will often result in much smoother running of a plant, and in the event of a breakdown, pump failure or other problems with components, down time will be kept to a minimum with little loss of time or money. Professional plat hire companies will consider a broad range of issues when diagnosing hydraulic pump faults. Successful maintenance programmes will speak for themselves, simply in terms of the results they offer in terms of enhanced system performance. What was the cause of failure? Was the problem successfully resolved? Could this component failure have been prevented? What will parts and material cost? What is the production downtime cost? When you start to track the progress of a hydraulic pump or system you can begin to see patterns and trends. This will allow for maintenance operatives to see what the potential consequences (either positive or negative) are. A professional plant maintenance company such as CJ Plant can provide planned and preventative maintenance services to keep hydraulic pumps running efficiently. Any modifications or changes to an existing hydraulic system should always be completed by a professional company by skilled workers with the right qualifications and experience. Most failures or hydraulic system problems can be prevented with proper maintenance practises. Any failures that do occur can by analysed and prevention taken to make sure that they do not occur again.